Finding Beauty in Negative Spaces is the fourth studio album by South African rock band Seether. The album was released in South Africa and Switzerland on 19 October 2007, and released worldwide on 23 October 2007. It is the first album by the band without lead guitarist Pat Callahan. The cover artwork was designed by David Ho, the same artist who designed the Vicious Delicious cover for Infected Mushroom. The covers apparently display the same character: Candice the Ghost. Three singles, "Fake It", "Rise Above This" and "Breakdown" have been released from the album with all three being top 10 singles, the former two reaching the top position on several Billboard charts, despite generally negative reviews from critics, scoring a 39 out of 100 on Metacritic. The album was reissued in 2009, featuring a fourth single, a cover of George Michael's "Careless Whisper", as the final single from the album. It is the first Seether album to reach gold status in their home country, South Africa. In the lower right corner where the album title appears, one can faintly see a Chinese symbol overwritten by the letters of the title. The symbol shown is 美, the Chinese character for the word "beauty", or "America". The album debuted at number nine on the Billboard 200 chart in the US with 56,900 copies moved in its first week, and ended up being certified Gold for shipping 500,000 copies. Seether claimed their first South African Music Award in the category "Best Rock: English" for Finding Beauty in Negative Spaces. "Quirk" is a demo version of "Fake It" & was apparently recorded in Morgan's bedroom. Later versions of the album, pressed after the release of "Careless Whisper", were released with tracks 13 & 14 added on. ^ "Finding Beauty in Negative Spaces". Metacritic. Retrieved 13 August 2016. ^ Erlewine, Stephen Thomas. "Finding Beauty in Negative Spaces - Seether". AllMusic. Retrieved 12 July 2011. ^ Graff, Gary (2007). "Finding Beauty in Negative Spaces". Billboard. Archived from the original on 21 October 2007. Retrieved 3 November 2013. 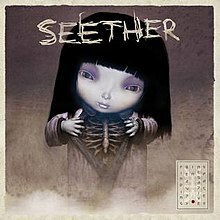 ^ "Music Review Review: Seether - Finding Beauty In Negative Spaces". Blogcritics. ^ Blackie, Andrew (1 November 2007). "Seether: Finding Beauty in Negative Spaces". PopMatters. Retrieved 3 November 2013. ^ a b "Critic Reviews for Finding Beauty In Negative Spaces". Metacritic. ^ Hiatt, Brian (1 November 2007). "Finding Beauty in Negative Spaces : Seether : review". Rolling Stone. Archived from the original on 2 February 2009. Retrieved 12 July 2011. ^ Jom (23 October 2007). "Seether - Finding Beauty in Negative Spaces Review". Sputnikmusic. Archived from the original on 29 October 2007. Retrieved 3 November 2013. ^ The Chinese character can be seen clearly here. ^ "America", in Chinese in full, is 美國, literally, "beautiful country". ^ Harris, Chris (31 October 2007). "Carrie Underwood Has An Easy Ride To First Billboard #1". MTV. ^ a b "American album certifications – Seether – Finding Beauty in Negative Spaces". Recording Industry Association of America. If necessary, click Advanced, then click Format, then select Album, then click SEARCH. ^ a b c d e f g h "Finding Beauty in Negative Spaces - Seether". Billboard. ^ "Seether - Finding Beauty In Negative Spaces". lescharts.com. ^ "Seether - Finding Beauty In Negative Spaces". charts.org.nz. ^ "Seether - Finding Beauty In Negative Spaces". hitparade.ch. ^ "Canadian album certifications – Seether – Finding Beauty in Negative Spaces". Music Canada. ^ "New Zealand album certifications – Seether – Finding Beauty in Negative Spaces". Recorded Music NZ. This page was last edited on 9 January 2019, at 17:47 (UTC).